Ready to Move Animals Around the Planet for "Aggressive Conservation"? This week a new paper revealed that humans have caused 322 animal extinctions over the past few centuries, and these numbers are alarming. But we can prevent more, using a tactic that some are calling "aggressive conservation." 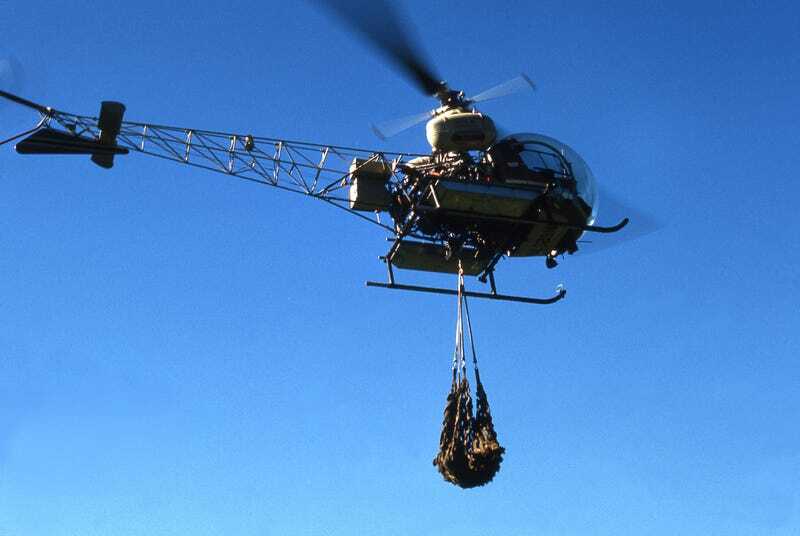 In the photo above, the National Parks Service uses a helicopter to move a tranquilized grizzly bear. This would involve intervening even more in ecosystems, but not to destroy them. We'd be using what we've learned about environmental diversity and stability over the past century to mitigate the damage we've already done. To avoid the sixth mass extinction we will probably have to employ more aggressive conservation, such as moving species to help them cope with a changing climate. Think re-wilding: reintroducing species like wolves or beavers that were once present in a given ecosystem but have since disappeared. Aggressive conservation might also mean killing off newcomer species to preserve or make room for local flora and fauna; in New Zealand, rat extirpations have helped kakapos survive. Based on an estimate published in Nature in 2011, we have a century or two at present rates before our depredations assure a mass extinction. This is something I've thought a lot about myself, and it's good to see more people responding to our dire situation with solutions rather than hopelessness.